933 MHz Digital Audio Power Mac Dual? I am really surprised at how well the 700 MHz with only 384 RAM runs, dvd playback is smooth, Network Screen Share no prob, sharing my photo and iTunes library through network awesome, Front Row works, smooth video playback from network, buggy upgrading the RAM ASAP. The Family Pack worked well for me. It's becoming clear that Apple was very conservative in setting system requirements for Leopard. We even have people running 350-400 MHz Macs who are pleased with performance. My only observation about the 867 MHz cutoff for Leopard is that it actually "strands" those of us that went for the more expensive dual processor 800 MHz available at the time. I realize that this may have been the only time that Apple's "flagship" model had a lesser sibling running a faster chip from the same G-generation, but I kinda feel like I'm being punished for buying the "best" machine when I realize that if I had not "gone for the gold" I'd still be supported. Then again, it is kinda funny when you realize how many year-old PCs can't run Vista - and here I am complaining that my 6-year-old Mac is just starting to show its age. We don't know what reasoning Apple had for setting 867 MHz as the tipping point for Leopard, especially since we've received reports from people happily running it on 350 MHz G4 systems. I agree that it was poor form of Apple to leave out the dual 800 MHz Quicksilver. I have installed Leopard on PowerBook G4 Titanium 550 using FireWire Target Disk mode from a 12" 1.5 G4 PowerBook. I have 1 gig of SDRAM and an upgraded 80 GB Hitachi 5400 rpm hard drive. Front Row runs fine and plays Video_TS files over the network. Video playback can be a little choppy sometimes, but I think that's down to the graphics card. I am unable to load DVDs recorded in DVD-R or DVD+R on the standard DVD-ROM drive; I can't remember which I was able to read before and System profiler no longer displays the types of media I can play back. I am able to load standard Region 2 DVDs, and they all playback fine in DVD player. I am unable to test Time Machine and and haven't had a chance to test VLC, but to be honest I don't use it anyway. The Dock is a bit jerky when running the mouse over it and using magnification, and Stacks work fine, but they do take a while to appear. 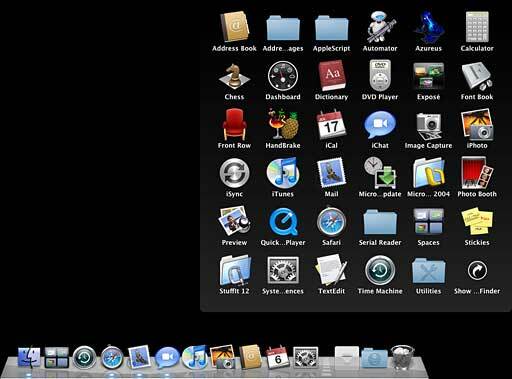 The fan looks as it should, but the grid is missing it's outer board, as are the backgrounds to the names above icons in the dock (see images attached). Oddly, taking a screen grab puts back the missing boarder element on the grid view as seen in the attached screen grab. Generally most apps launch and take a little while longer than in Tiger, the Finder seems fine but is a little slow. Preview has a major bug: if you make a change to a file you are unable to save, the App simple bombs every time, this could be down to my hardware not supporting Core Image or something? WiFi seems to be poor, even sat next to the wireless router, and I don't get full reception . . . this could be a Leopard problem though. I have published Xbench results on the Xbench Comparison Site, but I am afraid I didn't have the benchmarks from before the update, hope it helps all the same. Thanks for all the info. I did some rooting around on the Xbench Comparison Site and found another G4/550 PowerBook with the same hard drive as yours. Running Tiger, it scored 16.77, while your machine with Leopard scored 15.34. Looking at individual tests, "AltiVec Basic" is consistently about 30% lower with Leopard, while the Allocate Memory test benchmarks 80% higher under Leopard, and Leopard also does better with OpenGL - nearly 50% better than under Tiger. Uncached hard drive results are better under Tiger, but by 20% or less. It looks like there are a whole lot of changes under the hood, as the overall CPU score under Leopard is one-third higher than under Tiger, Threads average about 20% slower, memory and graphics about 15% higher, User Interface 30% slower (the Core Graphics load), and hard drive results about 15% better. Apple has reprioritized things in Leopard, and older, slower hardware where the G4 CPU has to handle the Core Graphics load are paying the penalty when it comes to the user interface. I've also looked at a pair of 2.5 GHz Power Mac G5 Quad results under 10.4.9 and 10.5 on the same computer. Overall, Leopard scores 1.6% lower than Tiger - 0.3% better on the CPU test, 20.3% slower on Threads, 7.3% faster on Memory (a whopping 52.3% on memory allocation), 26% better on Quartz Graphics, 1.6% higher on OpenGL Graphics, 28.7% slower on User Interface, and 15.8% lower on Disk Test. Finally, I found an Intel iMac that had been benchmarked under both 10.4.10 and 10.5. The overall score was 1.3% lower under Leopard: 13.8% better CPU score, 21% worse on Threads, 8.7% higher for Memory (an incredible 115% higher for memory allocation! ), 19.7% better with Quartz Graphics, 36% better with OpenGL, 30.8% worse in User Interface, and 18% lower doing Disk Test. Conclusion: Whatever your hardware (G4, G5, Intel), threads are about 20% slower under Leopard, memory access is better, Quartz graphics are 15-25% better, the user interface is about 30% slower, and CPU utilization is slightly improved. I did have a feeling that everything was running a lot slower and really that was to be expected. I am looking to get a new Macbook Pro early next year so I'm sure my Leapord experience will be better on a more optimised system. Leopard is good but it does have some issues and hopefully a lot of those will be fixed in the 10.5.1 update. Maybe you can help, I purchased a Digital Audio Power Mac Dual G4/933 on eBay. Model #M5183. I cannot find reference anywhere that Apple made a Dual 933 in any model. I am running Tiger 10.4.10, I have read that Tiger has issues identifying the Digital Audio model. I have input the serial number at Apple, and it is definitely a Digital Audio model. Just trying to find out if this is an issue with Tiger or if I really have Dual G4 933s, or it is really a Dual 533? I removed the heat sink, and it is an Apple processor board, not an after market. The XB that begins the serial number indicates that this was not a stock machine. Although the Digital Audio was introduced at 466-733 MHz and included a 533 MHz dual model, yours was produced late in its production life - early June 2001. At that time, Apple was preparing the Quicksilver Power Mac G4 for mid-July release, and even that topped out at 867 MHz for a single CPU or 800 MHz for a dual processor machine. I'm not familiar with any problems with Tiger misreporting CPU speed in Digital Audio Power Macs - even Google is coming up dry. This is the first I've heard of a 933 MHz dual G4, and I'm sure Mayo must have paid dearly for these computers, as Apple didn't officially release a model this fast until January 2002. You apparently have a genuine rarity on your hands. I got idea that I can not do myself. It would be nice if some readers that already installed Leopard would show what is Leopard System load is in Activity Monitor after clean start up, especially on old hardware. If somebody could compare it to Tiger, it would be even greater. Good suggestion. I'll post it to the Mailbag to see what kind of response we get. XResourceGraph is another great free program for tracking CPU usage, among other things. It still isn't clear to me. Will Leopard install directly on my G4 Digital Audio with 1 GB RAM, upgraded to 1.2 MHz G4 processor? I don't need the latest and greatest computer, but I can see where Leopard may have value. Backup is now a big deal: I do direct backup to FireWire drives. It's incompatibility with web browsers, and Internet "exchange" that is the real issue. I don't have a Digital Audio Power Mac or a copy of Leopard, but the field reports I've read say that you cannot simply insert the Mac OS X 10.5 installer and run it. You either need to create a hacked copy or use another Mac to do the installation. That said, it's possible that the installer will see the upgraded CPU and run. It seems to work for some people with upgraded systems. VLC will play DVDs, but with such a slow frame rate that the video is unwatchably choppy. The same thing happens when playing ripped .iso files as well. Leopard seems very confused about the removable DVD drive. The only way to eject a disk once it is mounted is to physically eject the DVD drive itself, reinsert, and hit the "disk eject" button on the drive before it has a chance to mount the disk. The bottom line is, Leopard does work on an upgraded Pismo, but is really confused about what to do with the multiple battery/device bays. Once (if) Apple releases the kernel source, I may poke around and see if I can fix things, but for now, I may be swapping back to Tiger on this machine. Tiger "just works" on it. Thanks for the follow-up. Except for DVD and second battery issues, it sounds like Leopard works decently on a G4-upgraded Pismo. I have Leopard installed on my 800 MHz G4 Quicksilver (1.5 GB RAM, ATI 9600 Pro AGP with 64 MB of video memory). Video card I bought on eBay from applemacanix. It is a modified card from a G5. I installed Leopard using a MacBook 1.83 GHz Core Duo on to a USB drive. I used the same procedure as FireWire Target Mode, only I used a USB drive instead. I can say this: at 12 MB a sec, copying was very very slow, but it worked. I have a third party DVD burner installed in my Mac (Lite-On DVD-RW LH-16W1P). This drive worked under Tiger and works again under Leopard. DVD player works with no noticeable lag. Can anyone tell me what the difference is between "Hardware Accelerated" and "Supported" in Core Image means? Okay, I have taken enough of your time. I'm really happy with Leopard on my QS. Thanks for your report. You must have the patience of Job to use a hard drive at USB 1.1 speed! USB 2.0 has so become the norm that I now have two USB 2.0 cards in my Power Mac G4 - printers, flash drive, film scanner, video converter, etc. Only the keyboard, mouse, and UPS are plugged into USB 1.1 here. "Hardware Accelerated" means that your graphics card supports Core Image, so your CPU doesn't have to handle it. "Supported" for Quartz Extreme means that your graphics card fully supports Quartz Extreme. I just thought I'd let you know I successfully installed Leopard on a first generation, non-uni-N "Sawtooth" without any work around. The machine was originally a 350 MHz model. It has been upgraded with a single 1.0 GHz 256K L2 OWC Mercury G4 card, 1 GB of RAM, and a Radeon 9800 Pro 128 Mac Edition. I ran the installer from the internal SuperDrive, and it was very happy to do it's thing. Leopard runs just fine on the machine (once Spotlight and Time Machine have done their thing). I enjoy the site, keep up the good work! I was looking at all the models that people have been trying unsupported Leopard installs on, and it it surprises me that nobody seems to have tried getting it running on a beige Power Mac or comparable PowerBook yet. Maybe we need to put a call out to all the Mac hackers with G4 upgraded beige machines and PowerBooks to attempt a Leopard install and report back how it went. I received two reports late last week (they're in Monday's Mailbag) of Leopard running on G4-upgraded Pismos. Both users had 550 MHz upgrades and said performance was a bit sluggish. One also noted that DVD Player didn't work. I haven't yet heard from beige G3, WallStreet, or Lombard owners with G4 upgrades. Or, for that matter, from any of the handful of G3 iMac owners with G4 upgrades. We do have one person working on an upgraded Blue & White G3. I'm really waiting for someone to install it to a 7300-9600 machine. That would be interesting. Those things run forever. Yeah, they do, and I'm sure someone is going to try it eventually. I've asked on our Unsupported OS X List to see if anyone has tried it yet. With all the architectural changes in Leopard, it could be the end of the line.